Orion (the Hunter) climbs the sky. 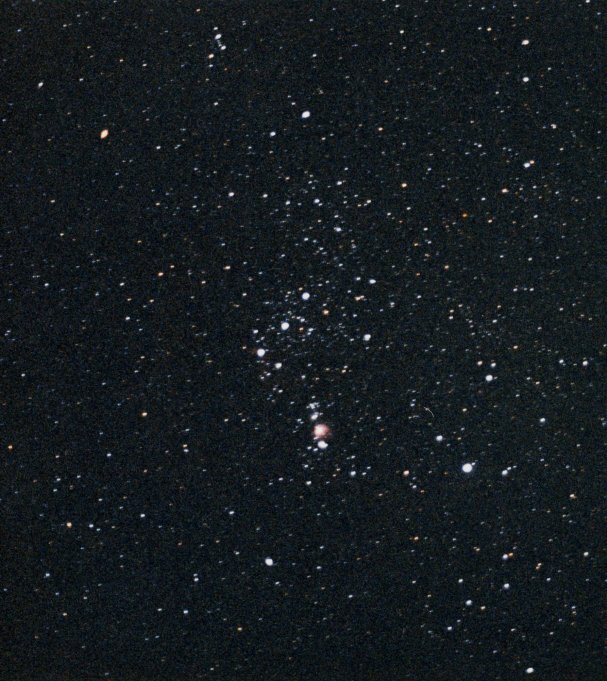 Orion's belt, Mintaka at right, Alnilam in the center, and Alnitak at left, runs through the middle of the picture. Betelgeuse is the bright reddish star at upper left, Rigel the bright star at lower right, Bellatrix the star to the right of center above the belt. Saiph is centered near the lower edge of the picture below the belt. Orion's head is marked by the trio of stars at the top of the picture just left of center, the brightest of which is Meissa, with Phi-1 (right) and Phi-2 below it. Mu Ori is just up and to the left of Betelgeuse. The the red glow in the middle of Orion's Sword is the Orion Nebula, which is lit by Theta-1 Ori. The multiple star Sigma Orionis is just down and to the rightof Alnitak, while Eta Orionis (Saif al Jabbar) is the second star down and to the right of Mintaka. To the upper right is a vertical string of stars all named Pi Orionis, from top to bottom Pi-3 (Tabit), Pi-4, Pi-5 (the one with a neighbbor), and Pi-6. Pi-1 and Pi-2 are off the top of the picture near Taurus.. W Ori is the second star down and to the left of Pi-6, while VV is the right-most star of the trio to the left of Alnilam. Orion's upraised club, topped by Chi-1 and Chi-2 Ori, rises off the picture at upper left; the two "Chi-stars" are visible on the images of both Gemini and Taurus. Tau Ori is just up and to the left of Rigel. Along with Cursa in Eridanus, it (and two others) it is part of Orion's Footstool. Then look for Omega Ori right between Alnitak and Meissa and 31 Ori just down and to the right of Mintaka. 32 Ori is just down and to the left of Bellatrix, while Psi is about halfway betweeen Belatrix and Mintaka, with 25 Ori just down and to the right of Psi. Betelgeuse is at the northwest apex of the Winter Triangle. See Orion in context with the Winter Triangle. See Orion in context with Canis Major. Orion has a star with an orbiting PLANET. See Orion from Flamsteed's Atlas Coelestis Edition of 1721. See a closeup of Orion's Belt and Sword. See the Orion Nebula and its spectrum. For more on Orion, see Hunting Orion at Stellar Stories.